Bearded dragons are not actually the mythical creatures their name suggests; they're lizards of taxonomic genus Pogona. Bearded dragons exist in eight species. Inland bearded dragons (Pogona vitticeps) are the most frequently seen as pets. If you're planning on bringing one of these robust reptiles into your life, appropriate housing is a major factor to consider. In the past, bearded dragons kept as pets were born and caught in their Australian homelands. Nowadays, they're fixtures as pets in the United States, where they're often bred and brought up. Although their names give them a somewhat hairy reputation, they don't actually have beards. When they're trying to show others that they're boss, however, they expand the pliable skin on their throats, giving the illusion of beards. If you have a wee hatchling on your hands, the little guy won't need a massive tank right off the bat. Twenty-gallon tanks tend to be effective for babies, temporarily. Since bearded dragons are speedy growers, the youngsters soon require more spacious digs. Never keep a bearded dragon in a cramped setting, regardless of age. If you're looking to transition from a baby-size bearded dragon enclosure to one that's appropriate for adults, look for a tank that can handle at least 55 gallons -- nothing less than that. A single mature bearded dragon can fare well in a tank of that size. A pair of mature bearded dragons can usually do well in that size of tank. Go as big as you possibly can, however, even if it surpasses 100 gallons. 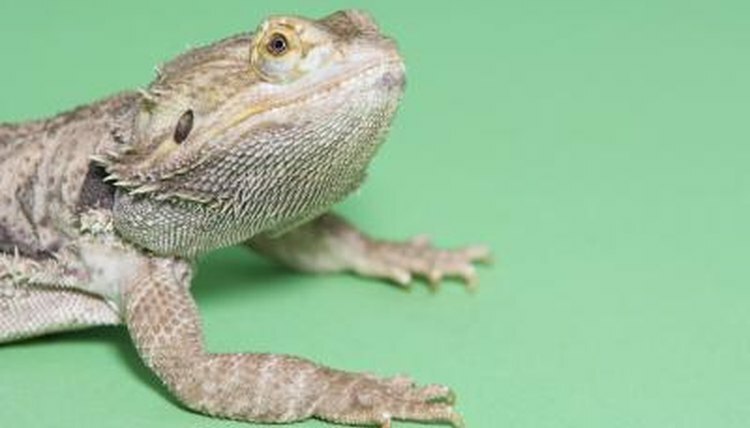 A spacious tank enables a bearded dragon to freely move about and get exercise. Free-roaming bearded dragons typically lead solitary lifestyles. Because of that, they often flourish in living all by their lonesome, with just human company. Some bearded dragons thrive with constant companionship, however. If you allow a pair of bearded dragons to live in a single tank, look them over carefully for signs of turf-oriented disputes and aggression. Refrain from keeping males together. Tank size is just the beginning in setting up a living environment that is conducive to a captive lizard's optimal health and happiness. Ultraviolet-B lighting, for one, is absolutely necessary for keeping bearded dragons healthy. Basking lights are essential. Plentiful hiding boxes are key for bearded dragons, too. Artificial plants can be helpful for giving a tank a pleasant and cozy outdoor ambiance. Make sure to place ample stones, logs, driftwood and branches in your pet's tank. All of these things help bearded dragons accomplish their daily climbing and basking activities.